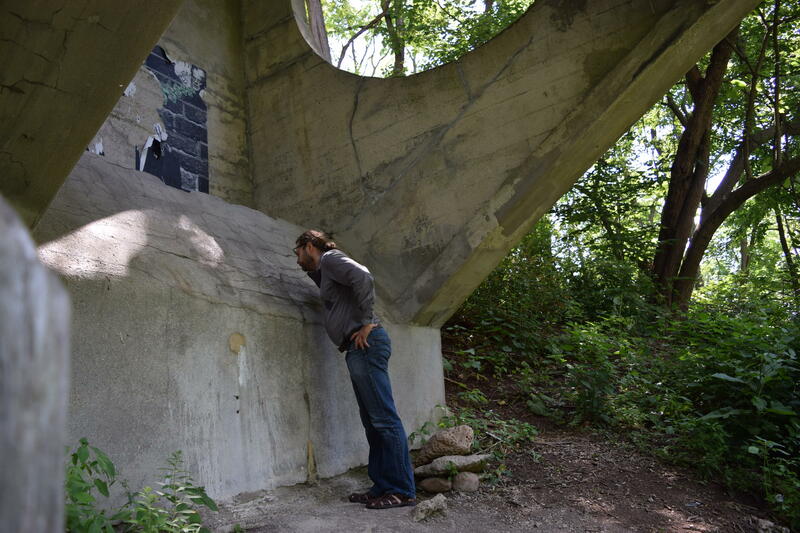 Can Historical Significance Assure Future of Lake Park Footbridge? Footbridge is popular route for dog walkers, joggers and bikers. UPDATE - After a long discussion Tuesday evening, the task force did not come to a concensus on whether to rehab or replace the footbridge. Several groups are keenly interested in the bridge's future, including the North Point Lighthouse Friends and Lake Park Friends. The groups plan to review the proposed alternatives with their members. The task force will consider those perspectives as the final selection is made. If you’re familiar with Lake Park on Milwaukee’s east side, you probably know its iconic footbridge. It’s looking pretty ragged. You can’t even drive underneath the bridge because it is so deteriorated. City of Milwaukee Historic Preservation interns Emma Rudd, Leila Saboori and Nader Sayadi spent a couple months digging into the footbridge's cultural significance. Emma Rudd says it’s not any old footbridge that people are concerned about saving in Lake Park; it’s about preserving Milwaukee’s cultural heritage. Rudd is one of three interns with Milwaukee’s historic preservation office who investigated the structure’s significance, starting with its designers. “The architects were Alfred Clas and George B. Ferry, two of the most important civic architects for Milwaukee’s development," Rudd says. "So it was interesting that these two men would design something so sculptural and small as a bridge. I think for them they thought of it as an opportunity to be a lot more artistic." Fellow intern Leila Saboori says the footbridge’s construction was also extremely innovative. It was a new method of working with reinforced concrete. “The patent was granted in 1903 and the bridge was constructed in 1905. And the company, the Kahn Bros Company was in Detroit and it was really interesting how this revolutionized concrete system showed up in Milwaukee after just two years,” Saboori says. At a public meeting last month, County Supervisor Sheldon Wasserman asked for a show of hands over what people wanted Milwaukee to do about the sorry state of the footbridge. “There were five different proposals and it was really narrowed down to two – the complete rehab for 50 years or a complete replication,” Wasserman says. Konstantin Sobolev would like to help by applying his knowledge about concrete; it’s fundamental to his DNA. "I was dealing with concrete really as long as I can remember myself. My father is also professor of civil engineering. His PhD was on concrete – my PhD is on concrete,” Sobolev explains. In fact, Sobolev is the only local academic who focuses 100 percent of his research on concrete. He says as technology continues to improve, the key is to make concrete more durable. As chair of UWM’s Department of Civil & Environmental Engineering, Sobolev thinks it can help apply state-of-the art methods to revive the Lake Park footbridge. “I’ve seen some cracks where they’re just simply filled up. But it means it was a temporary solution, is was not really a long-term solution," he says. "Again, this my guess regarding the quality of concrete, I need still to take a sample. But if they want to save it, we can find a solution. I can bring students on my team and professors from UWM and we can work on this problem. Might be perfect for a student graduate project." Tonight's meeting in Lake Park will give residents the chance to express their opinions, but the gathering will not end the footbridge discussion. County Supervisor Sheldon Wasserman plans to recommend tonight's top choice to his fellow supervisors. However, Wasserman will need to rally support among county leaders and come up with a plan to pay for the project. “This is a $2 million project. We don’t have dedicated money for the parks. We have a capital budget of $6 million; this is a third of the county’s entire budget,” he says. Tuesday evening’s meeting on the future of the Lake Park footbridge starts at 5:30 pm on the ground level of the park’s pavilion. The Milwaukee County Parks system seems to swing between two extremes. On one hand, its green space creates a ring, some compare to an exquisite emerald necklace. On the other, parks are crippled by deferred maintenance. One example is Lake Park, where officials closed a 110-year-old footbridge because it is crumbling. The fate of the bridge that spans a ravine, and a winding roadway below, will be the topic of a public information meeting this evening at Lake Park.